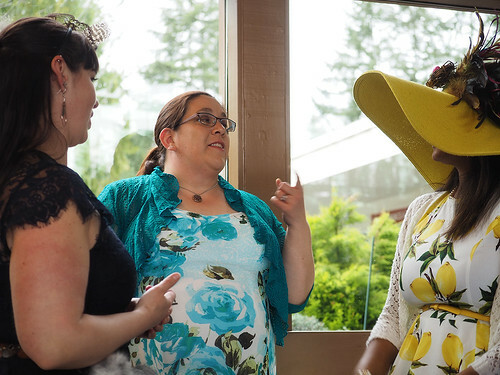 A food blogger conference friend that I kept in touch with on social media posted on Facebook that she was looking for a few more people to join her table at Lake Wilderness Arboretum's annual Hellebore Tea in Maple Valley. I thought it sounded like a fun event so I put me and Mark down for the last two tickets. Not having been before, I wasn't sure what to expect. It turned out to be 95% women and 80% of them wearing a hat of some sort. 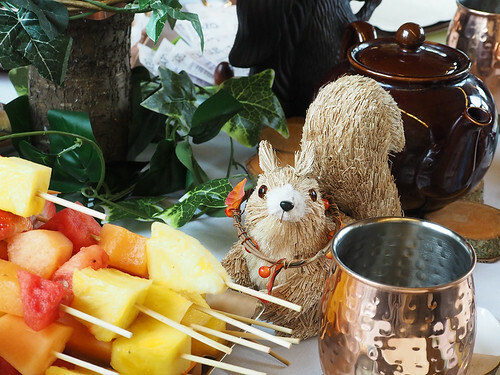 Sarah, the table host, mentioned that there was a theme for her table and it was woodland. It sounded like a good table theme. It was mentioned that most people dress up. I'm not a dressy uppy kind of person so I settled on some non-jean pants and a copper/brown shirt which turned out to match the table scape pretty well. I also put on some jewelry which I rarely wear. I have a pine cone necklace that I thought went perfectly with the theme. 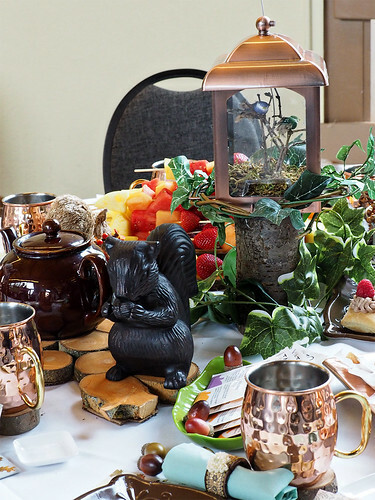 The table was decorated with copper tea mugs, squirrels, acorns and chopped wood for tea and kettle coasters. 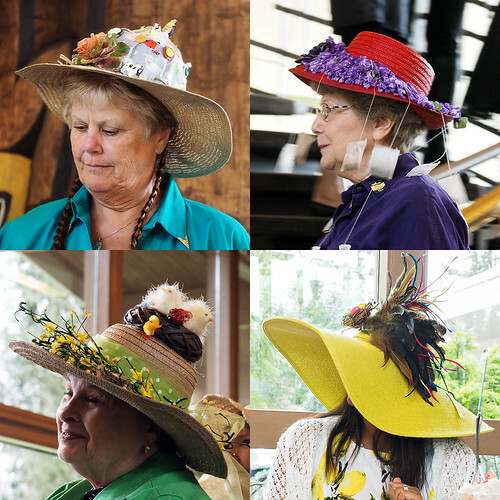 There were a couple of contests at the event, one for the best decorated table and one for the best hat. I didn't realize there would be a hat contest even though it said there would be right on the ticket. Needless to say, I didn't wear a hat but enjoyed all the hats everyone else was wearing. One of the tables next to ours had a chicken theme and everyone at the table had hats with nests, eggs and chicks adorning them. The funniest hat I saw was a lady with tea bags dangling from her hat. She ended up winning one of the prizes as did Shauntá at our table who wore an elegant hat with feathers from her chickens in it. This event was actually a fundraiser to benefit the Lake Wilderness Arboretum. 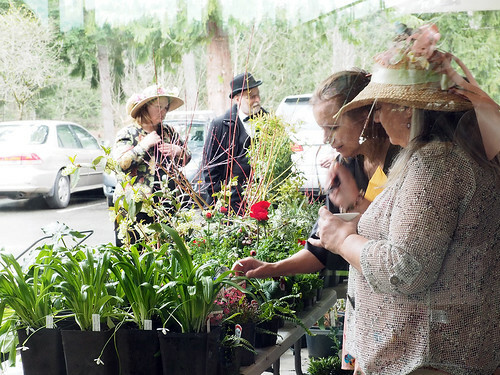 There was a silent auction and a plant sale. Unfortunately we didn't come home with any auction items or plants but we enjoyed the event and all the cookies, crackers, pastries and snacks that accompanied the tea.